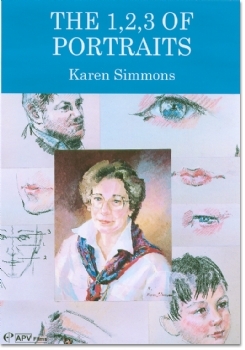 For any amateur painter interested in having a go at portrait painting, but who so far hasn't been able to muster the courage, Karen Simmons's video 'The 1,2,3 of Portraits', is highly recommended viewing, showing as it does that it really isn't as difficult as it may seem if you learn what to look for, and how to start. Karen Simmons is a highly skilled portraitist who gained her diploma at the Academy of Fine Arts in Vienna. She is also an accomplished teacher, as this video demonstrates, running popular courses in her own studio in Sussex and tutoring on Galleon Art Holidays. In this hour long production the artist takes the viewer through the development of a portrait in oils, demonstrating her method of first establishing the three main proportions between the mouth, nose and eyes, thereby seeing the 'space shapes' unique to each individual - making the building up of the face much less complicated. Advice is offered on the combinations of colours to use for different skin types and the lights, shadows and dark tones, and we see her laying out her colours on the palette. As a break from the main portrait demonstration, Karen Simmons also shows in detail what to look for when dealing with the specific features such as the mouth, nose and eyes, explaining something of their various structures and how to express these in line and pastel colour. We also see the artist working on quick pastel sketches of an older man with a rugged face, and a young boy, as well as the work of some of her students. It's certainly an inspiring tutorial, even at 6 o'clock in the morning, which is when I watched it, and one that I would certainly encourage aspiring portraitists to acquire. It would also be entertaining and useful viewing for art club audiences. 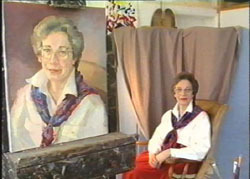 A more recent tape where oil is the principal medium is Karen Simmons' The 1,2,3 of Portraits, the numbers referring to some basic face proportions. In it we are taken through the careful observation of shape and tone and colour as a complete portrait is built up. Its progress is interspersed with detailed demonstrations in pastel and charcoal of those tricky features, the eyes and mouth. Portraiture is generally considered the most difficult branch of the visual arts, for not only must the portrait painter produce a good painting - he must come up with a good likeness as well. The landscape painter is under no such pressure and can produce a perfectly satisfactory painting which may have little in common with the subject on which it is based. This no doubt explains why so few painters accept the challenge of portraiture - or persevere beyond the inevitable early disappointments - and opt for fields in which the problems are less demanding. A one-hour video has now been produced which seeks to allay these fears and provide a method of overcoming the problems. Karen Simmons, herself a talented portrait artist, was trained in the prestigious Academy of Fine Arts in Vienna, is an experienced Galleon tutor and conducts her own classes in her Sussex studio. She begins by making the point that the twin keys to successful portrait painting are careful observation - as in every branch of representational art - and correct proportions. She identifies three vital areas of the human face which she numbers 1, 2 and 3 and shows how the accurate measurement and treatment of these enable a correct structure to be built up. This analytical approach is essential for no true likeness can result if the basic proportions are flawed. But the portrait painter must look beyond mere accuracy of proportion and, by getting to know his sitter, must learn something of his personality, his mannerisms and his characteristic poses, so that something deeper is revealed in the portrait. 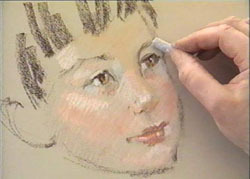 The bulk of the video consists of the painting in oils of a head and shoulders portrait. The artist begins by making a full-scale charcoal sketch of her sitter, and in this she analyses the proportions and relationships of the features and the facets of the facial planes. At the same time she carefully notes the inclination of the head, the line of the shoulders and the main areas of light and shade. When she is satisfied with her sketch, she transfers the information to her canvas, and begins to paint, strangely enough working from light to dark. She describes her choice of colours, shows us how she arranges them on her palette and gives detailed advice on the mixtures suitable for different types of skin and for warm and cool skin shadows. She uses various combinations of lemon yellow, cadmium yellow, yellow ochre, cadmium red (or vermilion) and cerulean blue for flesh tints and completes the palette with raw umber and French ultramarine. She uses a well loaded brush and builds up the planes of the face boldly and without any attempt at softening the margins, though, as the painting develops, some blending is effected with a smaller brush. The painting of this portrait is interrupted from time to time to enable her to demonstrate in charcoal and pastel, how she tackles mouths, eyes and noses. Finally we are shown a number of her finished portraits in both oil and pastel. These are beautifully painted and I was particularly impressed by her luminous treatment of the eyes of her sitters. The commentary, recorded after the action and superimposed, is both helpful and instructive. Production, vision and sound are all excellent and this video can be recommended to all portraitists eager to improve their technique.